(Newser) – Most people know that jelly beans contain sugar. A California woman, however, says she was left in the dark and now wants retribution. Jessica Gomez says she purchased Jelly Belly's Sport Beans—advertised as a supplement for carbohydrates, electrolytes, and vitamins—believing the candy had a lot less sugar than it actually does. Sugar, she notes, was not listed in the candy's ingredients. Only later did she realize that "evaporated cane juice," which was listed, was essentially the same thing, reports Forbes. Now, in a class-action lawsuit, Gomez argues Jelly Belly's omission of the word "sugar" from the label was a deliberate attempt by the company to deceive consumers. And Munchies notes she's backed up by FDA guidelines on the matter. If she was so worried she should have went online and checked out the ingredients. 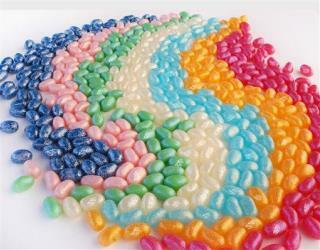 Never saw a jellybean I didn't like and its because of the flavored sugar. Always someone looking to make money on someone else's back. Now if it was peanuts or something that can cause a major allergic reaction and it was renamed, that is a problem. She didn't say she was diabetic. Oh look, a Cali snowflake who is too stupid to learn how to read, is suing over some nonsense...shocking. They should look on the label for her body - Contains "Evaporated BRAINS."